Having quite fair skin means I often struggle to find foundations that match my skin perfectly. I also shop online for foundations a lot and don't always get the shade matches right. 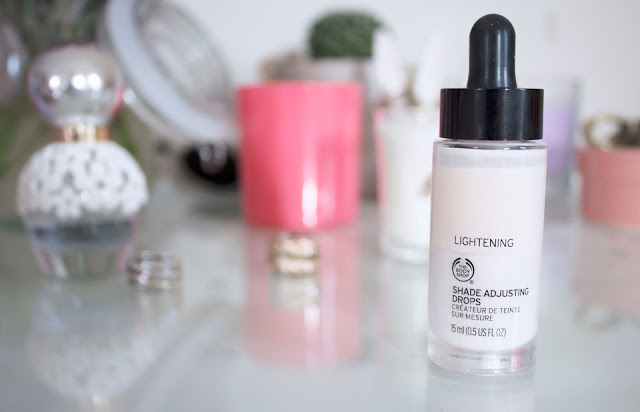 I was so excited when I heard about these Shade Adjusting Drops from The Body Shop, in fact I read one review and then went straight away to purchase them! For ten pound, I thought it was really affordable and a great product to give a try! You can choose between either Lightening or Darkening drops depending on whether you need to make a foundation lighter or darker. It's really easy to use, I apply my foundation to the back of my hand, add a couple of drops and mix together. I've used white foundation before to try and lighten foundations and it didn't work very well and seemed to change the consistency of the foundation. This however lightens the foundation while the consistency and pigmentation remains! I'm really happy with this product, I now don't have to worry about blending my foundations all the way down my neck in order to try and make darker foundations look natural and I can keep the foundations I own rather than buy them again in the right shades! 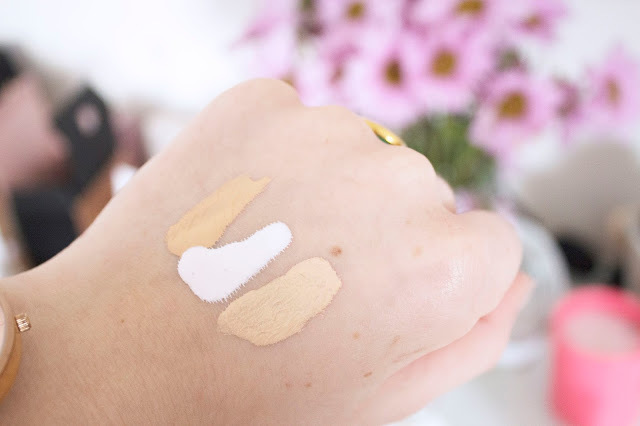 The above photo shows the foundation before, the drops and then the shade when I mix the two, as you can see, it also takes away any slightly orange tones to make your foundation match your skin perfectly! I'm so impressed with this product and I think for £10, it's a steal! I haven't shopped in The Body Shop for years however this is definitely making me want to try more products!